Did you know 4.8 billion Canadian Google searches are performed each month? And Canada is the leader on Google+ per capita. Not only that, but 25 million people in Canada watch online videos every month, and YouTube is now owned by Google. It doesn’t take a genius to figure out that if you want to move up in the online ranks, it is best to use the Google tools that are available to help you and your business climb to the very top. And to receive the most attention for your video marketing, you need to be connected to Google+. Google+ is quickly becoming an essential part of any business social media strategy. Boasting 500 million users, this social network is going to grow very quickly as Google is making a Google+ account mandatory for all Gmail users. Google+ is also playing a major role in SEO by making it easier for marketers to show up in search results. Creating a profile on Google+ is not unlike other platforms, but you must ensure you upload the correct size header that you create yourself to distinguish your business from another. Use tools such as canva.com and just scroll through the choices for designs to find Google+ Cover and have fun with the graphic editor, uploading photos of your business or product! Make sure to complete the bio and profile completely, linking to your verified website. Begin by sharing a blog post from your website, or even better make sure your blogs are set up to share automatically with Google+. When creating a post, use “+” as a call out—similar to “@” in Twitter—when mentioning people or trending topics. Increases awareness of your overall Google+ profile page. Adds a human element to your content and increases trustworthiness. Helps your content stand out from crowded search page results. Improves your chances of showing up in key word search results. Protects the original post’s ranking position as higher than a post that has scraped or syndicated the original content. Studies have shown that Google authorship increases click-through rates. Use Authorship to verify your blog. Verify your company’s Google+ Page to help increase your Google search ranking. Commenting on posts adds your “hover business card” to the chain of comments and creates a way for people to instantly click and link to your Google+ page. Even if you don’t have a lot of engagement on Google+, continue to post because it helps increase your website’s searchability. Social media is about building relationships and creating a human element. Google authorship allows you to do that with your blog. If you have ever Goggled a topic and on the left hand side seen a picture of the author attached to the blog article, that is how Google Authorship promotes individuals and businesses and unique content. Similar to Facebook and LinkedIn Groups, Google+ Communities pages help to build small niche groups around topics and interests. These pages are perfect to create private or open groups where members can ask questions and share ideas openly. Determining whether you want to use Facebook, LinkedIn or Google Communities pages largely depends on where your audience currently is online. Google+ has a mix of products available including Google Maps, Google Docs and one of their hottest new tools, Google Hangouts. Google Hangouts is a free video conferencing service that allows you to connect with other Google+ users through video. Use Google Hangouts to record videos with key influencers and then stream it on your YouTube channel or it can be used to have a video conferencing call with other stakeholders. As you can see, there is plenty to learn and the more advanced strategies will help you reach even higher. If you have any questions, share them below for me to answer and watch for my post on Advanced Google+ Marketing for Business. Social media marketing can be a powerful tool to help any business grow their sales, increase brand exposure and build relationships with customers. Yet, so many businesses see little to no success when it comes to social media. A blog is your main hub for updates, content and announcements (blog may be connected to your website). It is the one channel that an organization has entire control over with content and functionality. Empower your audience. Be the one to give the information and be willing to share more if asked. Your content should be what your audience is asking for… if they don’t get the information from you, they will go to the competition. 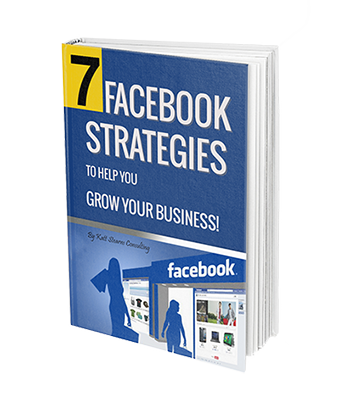 Free e-book: 7 Facebook Strategies to Help Grow Your Business Enter your name and email to download your free copy. "I understand that by submitting this form, I agree to receive periodic emails from Katt Stearns Consulting. My consent can be withdrawn at any time using the links provided in every email." Strategy // Creating a social media strategy is more than just determining how many times you are going to be posting a week. It starts by first..
Ok, I just spent 3 days of intense learning on everything social media. What do you want to learn about most? I’m attending #SMMW19 in San Diego this week and we just got out of todays keynote that was talking about all things Facebook and Instagram Stories. I am in Nanaimo today preparing for a 2-day presentation to numerous tourism organization on Vancouver Island for Destination BC. It’s funny..